If you are searching for a fun party activity or family game, consider planning a treasure hunt. 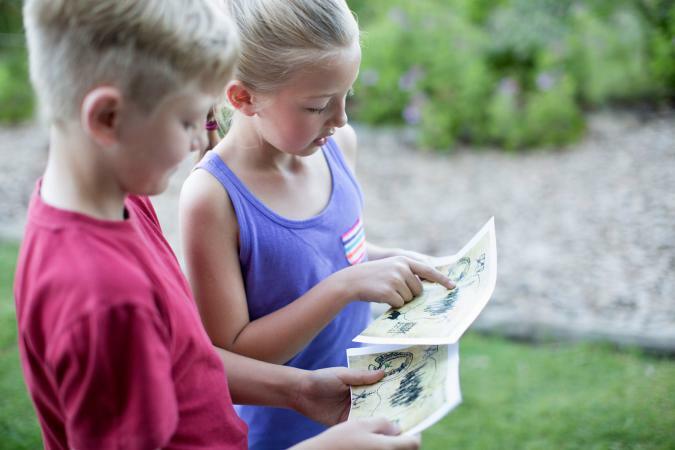 A treasure hunt is a fun activity that kids of all ages can enjoy. The versatile game is suitable for large parties or small family gatherings. Treasure hunts are also relatively easy to plan once you figure out the theme, clue types and treasure hunt prizes. Choose a theme several weeks or days ahead of the treasure hunt date. The theme you choose will help guide the type of clues, map and prizes you create for the treasure hunt. Story hunts are treasure hunts that incorporate a storyline. For example, participants in a Beauty and the Beast treasure hunt can help Belle look for Beast's lost enchanted rose with clues and prizes relating to his magical castle. Prizes are hidden in a certain location, and participants search for them without clues. Many Easter egg hunts operate in this manner. Create a traditional pirate-themed treasure hunt by hiding a chest of jewels or gold coins somewhere throughout the house or in the yard. 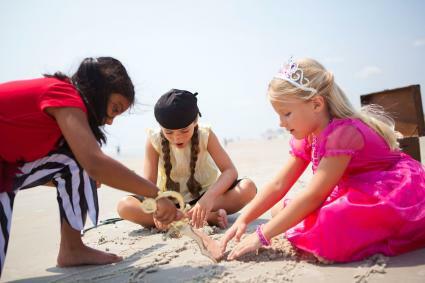 Have kids dress up as pirates and follow an antique-looking map to find the treasure. Design a treasure hunt to reflect a popular holiday such as Halloween, Easter, Valentine's Day or Christmas. Incorporate holiday decorations or symbols and traditions into the treasure hunt. For example, hide clues for a Halloween treasure hunt inside carved pumpkins, ghosts made from paper bags or bowls of candy. For older kids, hold a treasure hunt in a local mall. Write clues to lead kids to different stores and make the treasure a toy store, candy store or special item your child has been asking for. Turn a treasure hunt into a learning experience. Have younger children practice their alphabet skills by discovering items that begin with all 26 letters of the alphabet to find the treasure. Use word problems or simple math equations for clues to help children determine where to go next or how many steps to take as they search for the treasure. If you are creating a treasure hunt for your family, consider personalizing the theme. You can design a theme based upon one of your kid's hobbies or a family experience like a vacation. You may also design a treasure hunt to reveal something special to your child, such as a new baby or the location of a special trip. Scavenger hunts can be very interactive, requiring kids to gather or take pictures of certain items, making them a type of hunt kids of all ages love. You can either incorporate prizes throughout the hunt as the items kids needs to find, or have a hidden treasure at the end of the hunt for them to find. Once you have decided on the right theme, it's time to plan the rest of the hunt. You'll need to define the parameters and area the hunt will take place in, decide how complex/how many clues the hunt will involve, write the clues, and decide on prizes or treasures for the hunt. A map is a helpful addition to the hunt, and you may want to incorporate props or costumes as well, depending on the theme and amount of time you'll have for the hunt. Finally, you'll need to hide the clues and get the hunt started! There are lots of choices when it comes to where a treasure hunt can take place. From a local park to a playroom, you can make it large or small. The season, ages of the kids, theme of the hunt and other factors will all influence where you decide to stage the activity. Younger kids may do better with smaller hunts that are confined to a few rooms or designated outdoor spaces, while older kids can expend their energy looking in broader areas. 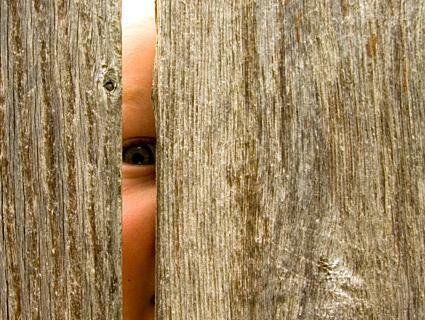 Make sure to clearly convey the area for the hunt and make sure kids are aware of any off-limits areas. Hints: A written message that give the participant an idea of where to look for a prize by describing small details of a hiding place. Puzzles: A short sentence or two that is missing words that describe a treasure location. Riddles: A short rhyme that hints at the location of a prize. Objects: A certain object or collection of objects gives clues to the location of prizes. For example, you could mark ten Dora the Explorer noise makers with a different color marker. Each color leads to a treasure location. Make sure that your clues are age appropriate for the kids involved. The clues should be challenging enough to be fun but not frustrating. Number all clues so it is easy to remember where to put them and keep a list of clues and answers in case kids get stuck. If you would prefer not to create your own clues, look download free treasure hunt clue sheets which contain pre-made clues designed to fit a specific treasure hunt theme. How complex the clues are and the number of clues you use will depend on the ages of the kids involved in the hunt. When placing the clues, make sure to place them in distinct enough places that one clue won't accidentally lead to another. Depending on the level of challenge the hunt calls for will also impact where you place the clues. Make them more cleverly hidden to make it harder and make them more clear or out in the open to keep it simple. Make sure finding each subsequent clue isn't too difficult in order to keep in fun and avoid frustrating the hunters. If planting clues outdoors in advance, consider protecting them (in something like sheet protectors, clear plastic bags, or plastic cases) in order to keep moisture from smearing the clues. Draw a map for children to follow at some point during the treasure hunt. You may choose to draw a map that includes all of the clue spots and write clues that have children determine which spot contains the treasure, or give children a letter or word at each clue spot to write on the map and organize to determine the location of the final treasure. A map may also be given to help children locate the first clue or as part of the last clue to help children find the final treasure. Decorate the map with drawings or stickers to fit the theme of the treasure hunt. Use this paper to draw your own authentic-looking treasure map. To print, click on the image and then use the print or download icon. Using printable map paper such as this also makes it easy to come up with an impromptu hunt on a rainy day. 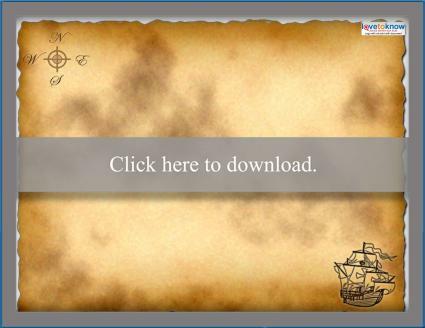 Click to download this printable treasure map paper. The treasure hunt is bound to be fun, but kids will look forward to the surprise at the end of the hunt! You do not have to spend a large amount of money on a treasure for the treasure hunt. If you are just using the treasure hunt as a way to entertain your children on a normal day, decorate a box and fill it with items from you find around the house or home-baked cookies. For a birthday party, look for inexpensive toys, games, stickers, coloring books or candy at the dollar store. If the treasure hunt is part of a birthday party, remember to have enough treasure so that every child receives something. Hide the treasure so it is not visible as children complete the treasure hunt. Ideas to hide the treasure well include burying it in a sandbox, hiding it in a bush, or placing it under a bed or behind a couch indoors. You may also prefer not to hide anything and simply reward children who correctly answer all of the clues and reach the final destination. Treasure hunts can challenge kids individually to solve the clues, but having kids work together as a group can also be fun and beneficial, especially when there are multiple ages involved. As a parent, you can appreciate the many benefits of a treasure hunt. You can plan a treasure hunt for kids on any budget. The game is suitable for almost any occasion. Treasure hunts also offer fun opportunities to encourage social interaction at parties, provide quality family time or make an educational subject more interesting. This certainly explains why treasure hunts are popular. Although treasure hunts are usually considered kids' party games, they are perfect for using during an indoor recess or cold winter weekend. Plan a treasure hunt, putting all of the clues, maps and treasures into a shoebox or plastic container. Keep it hidden in a closet, ready to use whenever the time is right.